As the days of British Summer Time get longer a compensation for me is that the Sun is rising high enough to be visible again from my northwest facing garden. I love my solar observing in both the Hydrogen Alpha (Hα) wavelength of the Balmer series, using a Coronado Personal Solar Telescope (PST), and with a normal telescope in white light, but with a Herschel Wedge removing around 99% of the available light for safe observing. Considering that we’re near solar minimum there’s been a surprising amount of activity to be seen around the end of March and the beginning of April. The most dramatic events have been in Hα, but even white light views have been impressive. The cause of the excitement has been a pair of large Active Regions (ARs). The first of these (AR12644) produced some large eruptive prominences as it exited the face of the solar disc on 3 April. I was lucky enough to be observing then with the PST with a Baader Zoom eyepiece, and the events were fabulous. I don’t image, and was too busy observing to sketch, but fortunately NASA does image almost continuously with the Solar Dynamics Observatory (SDO) from orbit. This is what they came up with, and despite their use of the ultraviolet part of the spectrum it’s not too far from the PST view in the red of Hα (656.3nm). 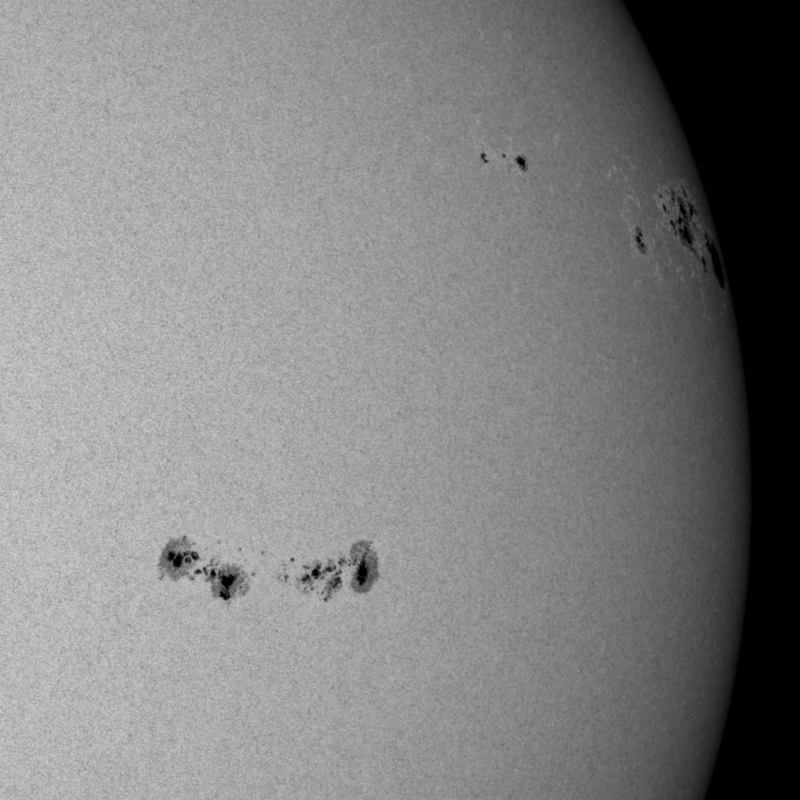 An image of AR12644 on 3 April 2017 at 30.4nm wavelength by the Solar Dynamics Observatory (SDO). Credit: Solar Dynamics Observatory, NASA. It is just a little more detailed and has a larger image scale. They also have some movies of this solar eruption, and trust me, you could see that big prominence changing before your eyes! I checked out the white light view too, but there was no indication of the violent events to be seen. The clusters of sunspots and surrounding faculae were plain to see in all their intricate detail despite sitting right on the limb in the image below. It was taken by the SDO HMI instrument, but is very similar to my white light view. 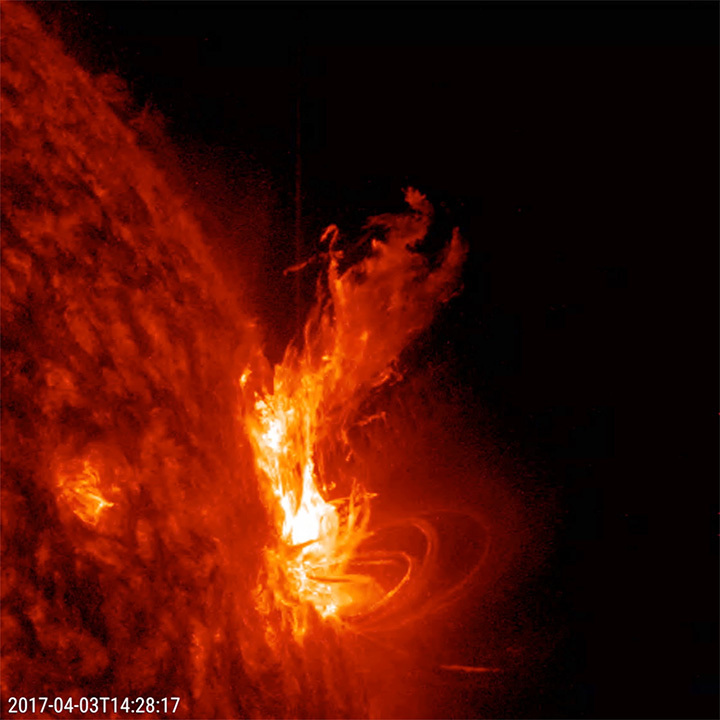 HMI Intensitygram of AR12644 and AR12645 3 April 2017. Credit: Solar Dynamics Observatory, NASA. In its wake followed the equally large AR12645 in the lower left of the image below. If anything it was more impressively detailed in the wedge, and I found it to be naked eye visible through some Baader solar film (another method for safely viewing the Sun). It didn’t produce any Hα fireworks, but the sharp filaments and swirling patterns in the spicule and fibril background of the solar chromosphere were beautiful to observe. These ARs were great to view throughout their transit across the face of the Sun, but will they survive to reappear for another transit?